Buying & selling of Pre-Owned or Refurbished handsets is an emerging trend which has generated $7 Billion in profits which is expected to double in the US market alone. Each year millions of devices are bought & sold through Gazelle, Swappa & Simplydrop. With RepairDesk now you can also run a buy-back program that allows website customers to get an instant quote on used, damaged working and fully damaged phones or displays with pre-set buy prices. Once a customer submits inquiry it generates a lead under Trade-In. An email and SMS notification is also sent to the customer with further instructions. Once admin update lead status as “purchased” device is added to your inventory for refurbishment. 1. In order to setup BuyBack Widget, create a new page on your website and paste iFrame code into FCK or WYSIWYG Editor. 2. You can add/edit/delete device and model in Manage devices. 3. 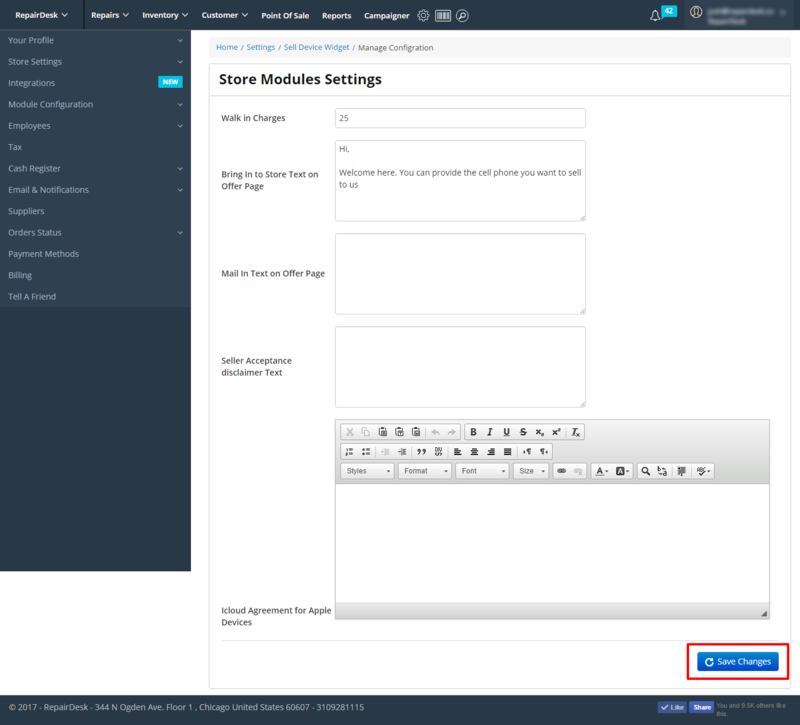 Widget Configuration - Set a pre-specified premium for walk-in customers or manage iCloud settings content. 4. Manage Device Color or add new. 5. Manage Device Size or add new ones. 6. Manager Device Networks or add new ones. Note: We have added a trigger in BuyBack widget configuration settings that prevents the user from adding manufacturer device, color, size and network or condition while making the lead. So if the trigger is enabled, user will not be allowed to enter these details. By default this trigger will be disabled. 8. When customer submits inquiry it will generate a lead in system and an email will be sent to admin & customer with further instructions. 9. Once admin updates lead status as “purchased” device will be added to the inventory. A user needs to click on transaction ID and Add payment against generated lead once it's marked as purchased so that it could be in stock. Q. Can I translate this in my primary language? A. Yes, certainly, you can use the language editor to translate it into any language. To know more about this feature and translate sections into your desired language, please click here. Q.Can I add price for a specfic device that will be shown to User while adding lead from buyback widget? A. Yes you can add the device price while adding a device in configuration setting of widget. Here you can add price and press enter, now that price will be shown on the widget when user selects specific device.